Good evening! 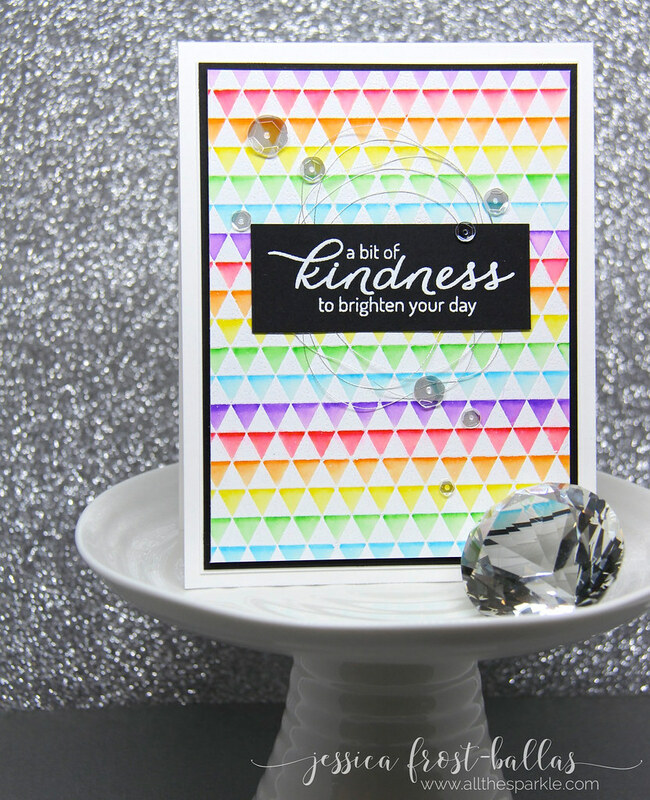 Jess here with a colorful card for our current Rainbow Challenge! There are a few more days to get your entries in! You can find more information on the challenge here! I love using bright colors so this was the perfect month for me! 🙂 I’ve been head over heels for my zig markers recently so I decided to pull them out for this card! This card was a little time-intensive but wasn’t difficult to create. 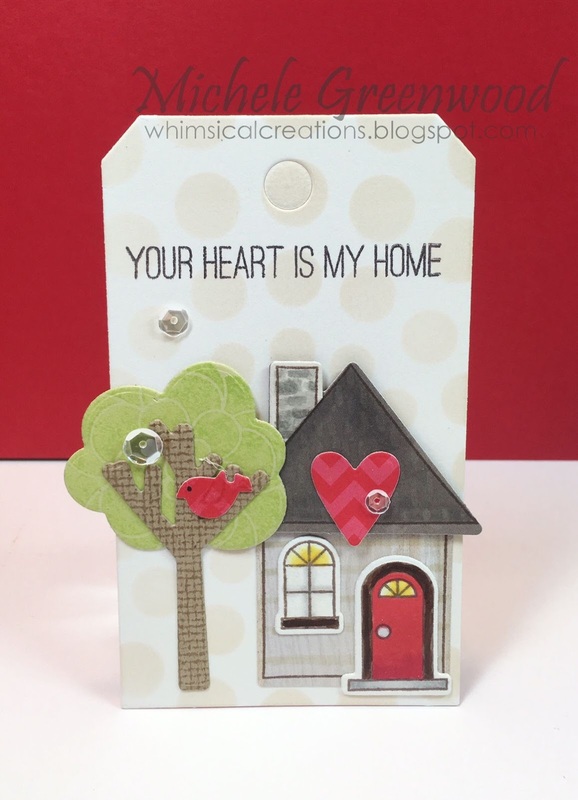 I stamped the background stamp on a piece of watercolor paper and heat-embossed it with white embossing powder. You could also do this technique with clear embossing powder if your watercolor paper is bright white. I use a watercolor paper that tends to be a little more yellow so I wanted the bright white embossing powder. Then it was time to color! I took a zig marker and drew a thin line across the top of each triangle. Then I used a waterbrush to blend the color across each triangle. I did one color at a time until each triangle was colored! Then I set that aside to dry while I worked on the rest of the card. 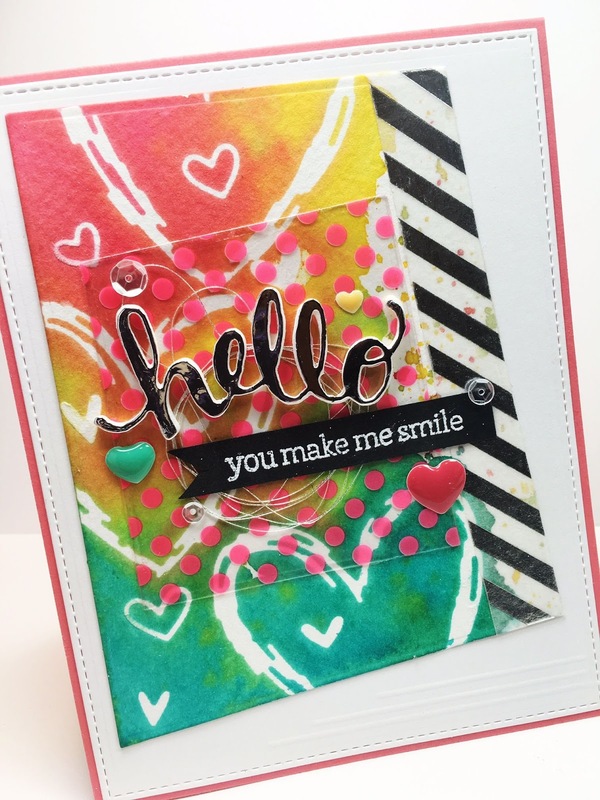 Hearts, polka dots, sparkle, stripes…AND BRIGHT! Hi friends! 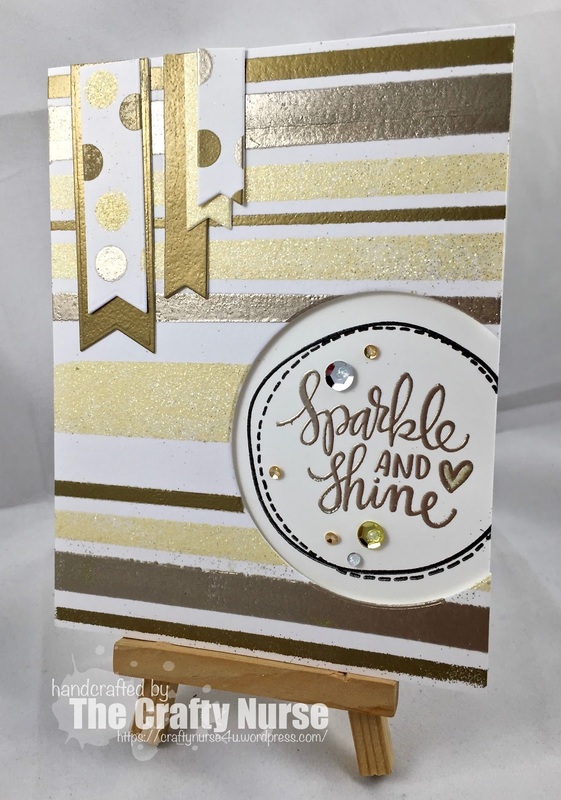 Welcome back to another card featuring Hero Arts, Simon Says Stamp and a wee bit of sparkle! We hope you’ll join this month’s challenge; you can link your cards up HERE! I used Distress Inks to create the background, re-heated the wax paper as Kristina shows in her video and removed the pieces. Voila, is that not gorgeous?!? Once it was completely dry, I gave it a spritz with shimmer sparkle – absolutely impossible to see in the photos, but it’s there, I promise!! I added some silver/white washi tape down the side and finished up the card. 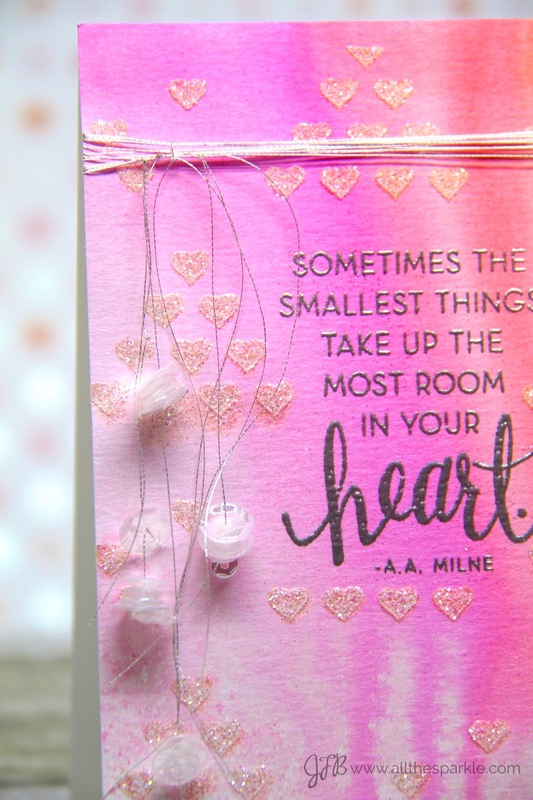 I layered on some pink polka dot acetate, thread, the HELLO stamp and die cut from Hero Arts cut from craft foam and silver card stock, and embossed the tag line on black card stock. I added some enamel hearts and sequins to finish off the focal point. For some added interested, I scored 3 lines in the lower right-hand corner at varying lengths. Thanks for stopping by; we can’t wait to see what little bit of sparkle YOU create this month! Have a great day! Hi, Jessica here! 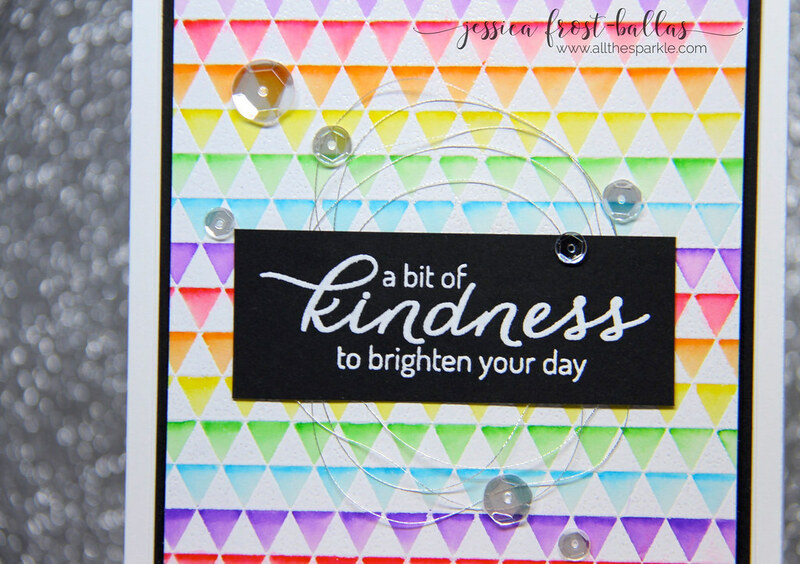 We’re finishing up this month’s collaboration with Pretty Pink Posh but I have one more card to share! 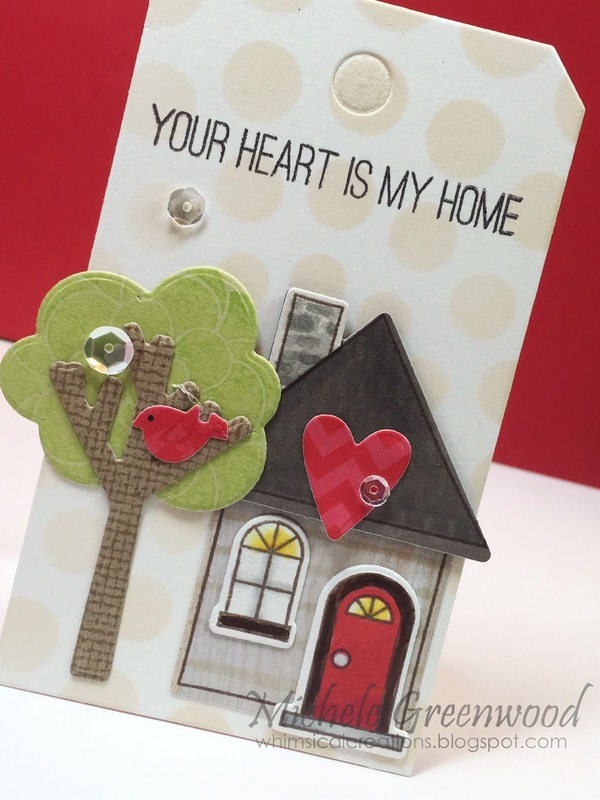 Once it was totally dry I stamped the sentiment from Hero Arts and heat-embossed it with silver embossing powder. 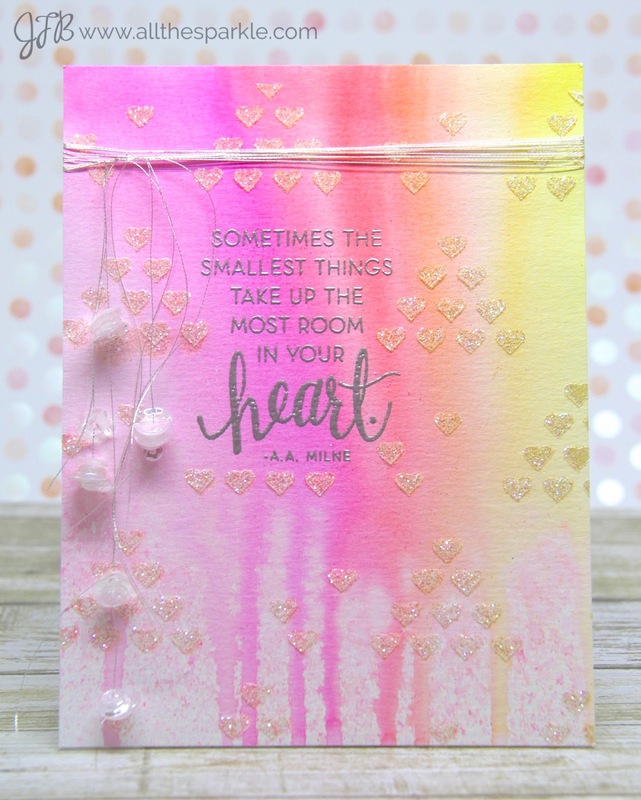 Then I masked the sentiment with a little post-it tape and then taped the Hero Arts heart stencil over the watercolor paper and applied a thin layer of pearlescent embossing paste. While the paste was still wet I sprinkled glitter over the paste, tapped off the excess, and then let it dry. While it was drying, I took a few strands of metallic silver thread and threaded varying sizes of Pretty Pink Posh sparkling clear sequins onto the thread in random groupings. Then I wrapped the thread around the top of the watercolor panel and knotted it, letting the ends of the thread drape down loosely. 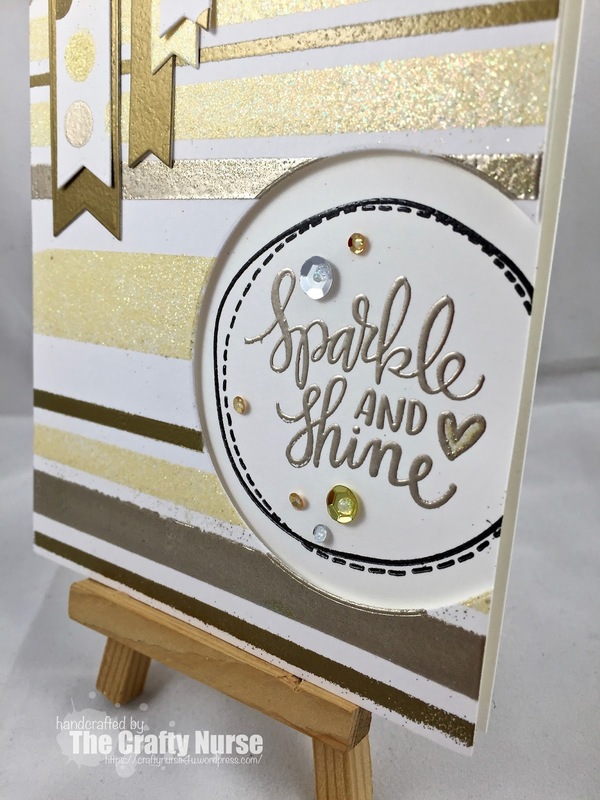 Thanks so much for visiting today and don’t forget to play along with our current challenge: Die-Cutting!